Jose Aldo may not be fighting, but Conor McGregor still has a shot at the gold when UFC 189 emanates from the Vegas strip on one of the biggest nights of the year. Chad Mendes—whose only two career losses have both came to Jose Aldo—will contest with the Irishman in the main-event for the Interim Featherweight strap, but there's more gold on the line even before the pair settle their heating rivalry. Robbie Lawler will meet Rory MacDonald for a second time at the MGM Grand on July 11—but this time the fight, which the reigning Champion won in a split decision, will be contested for the Welterweight Championship of the World, part of a stacked card. Here is all the breakdowns, tactics from weaknesses to strengths, advantages on the feet and on the ground and predictions for UFC 189: Mendes vs. McGregor. 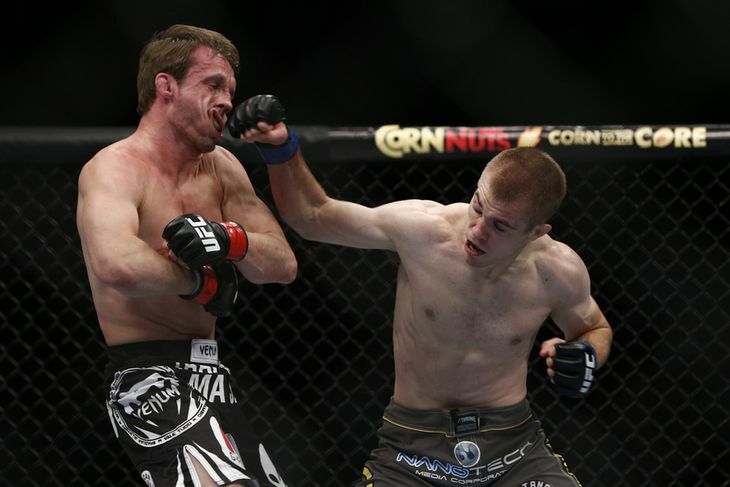 Chad is coming off a very impressive KO victory over a tough top contender in Ricardo Lamas. Mendes has big power in that right hand and can end your night if he lands clean. The key in this fight with Conor is somehow closing the distance due to Conor's 8-inch reach advantage. Chad will use level changes in attempt to keep McGregor guessing and close the distance to land that right hand. Besides the Lams KO, Mendes has KO'd a bunch of wrestler/grapplers with sub par striking like Guida, Meza, Mckenzie, Elkins for example. Those dudes are not even in the same stratosphere as Conor's level of striking. Chad has been working with Martin Kampmann to tighten up his technical abilities but I think it will be hard to close the distance to affect Conor. Conor has looked flawless striking so far. The fact that he finished a tough dude in Dustin Poirier with ease was super impressive. Although he's looked unstoppable he hasn't been put through any pressure. Poirier did knock one of his teeth out but he hasn't been in a war and we don't know how he will react—we can only assume. The timing and fluidity Conor has is fantastic but this isn't a striking match. It will be interesting to see how he strikes knowing that Mendes can possibly take him down. All in all, McGregor has the edge due to better timing, diversity, and fluidity, and speed. The power is probably about even. Mendes by default has the edge on the mat. For those who think Conor can out-grapple Mendes, what can you base that on? Because he passed Holloway's guard a couple of times? Look, I am not one of these guys saying he has no ground game, we just haven't seen him defend a legitimate takedown, gotten up from bottom, or pulled off any subs, and we have seen Chad do these things plenty of times. The jury is still out on Conor's grappling. The best submission threat he faced was probably Poirer or Brandao and they opted to stand with him which isn't his fault by any means. It's not his fault why Mendes has the edge, its due to the lack of competition against wrestlers and lack of time on the mat. No knock on him, just the facts. Mendes is a D1 wrestler who trains at Team Alpha Male. He has excellent transitions and scrambling ability. McGregor: Stuff the shots, "Rip his head off"
I will give Conor the benefit of the doubt here. I don't think Chad will consistently be able to close the distance without running into something. If he had more of a diverse attack like Aldo to get Conor to respect him than maybe. Chad always has a puncher's chance but I think Conor gets this done in the 3rd round. 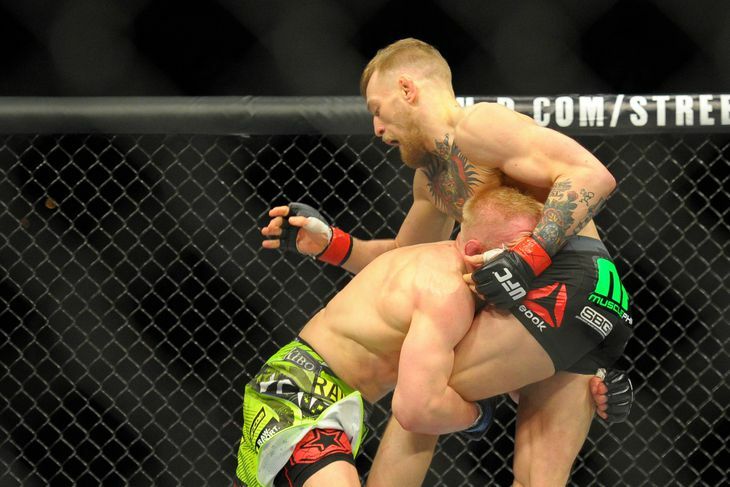 Chad's gameplan could be predictable as the shot is inevitable, but so is Conor's. I wouldn't be shocked if Chad won honestly. I haven't seen Conor on the mat or go through adversity. 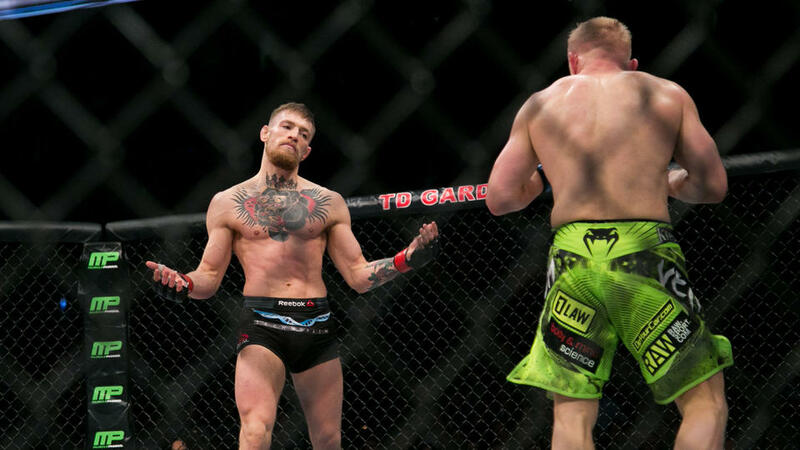 Conor McGregor defeats Chad Mendes via TKO (round three). Lawler has the type of power that you have to respect or you could be in trouble. Rory has power as well but I give a slight edge to Robbie in that department, especially considering he dropped Rory in the 1st fight. Rory is easily in the discussion for the most technical striker in the UFC. When Rory is able to settle in and find his appropriate striking range he can pick a fighter apart with relative ease. Both guys do everything well striking offensively. If Rory can get you to back up and hesitate and think he will most likely win this fight. One thing with Rory is how will he do in those brawl style exchanges? At some point in this fight Robbie will bite down on his mouthpiece and just slug it out. Him coming forward throwing those big shots is a scary thing and Rory couldn't handle it in the last round, but this fight is 5 rounds. I give the power edge to Lawler, but the technical edge to Rory. This aspect is the key to the fight for Rory in my opinion. Rory took Lawler down several times in their first fight. This is the biggest flaw in Lawler's game as he has a tendency to get taken down and controlled. I thought he lost both Hendricks fight but the will to win and never quit won him the fight. If Rory can take him down and he can definitively stay ahead on the cards. This fight could go either way in my opinion. I think Rory will be very cautious and stay out of any big exchanges with Lawler. I think Lawler will definitely have his moments but I think Rory will mix in the takedowns and stay on top long enough to edge out a decision. Rory Macdonald defeats Robbie Lawler via split decision. Pound for pound, Stephens is one of the heaviest hitters in MMA. This is a blessing and a curse because he has a tendency to load up and be predictable at times, but when he lands cleans guys stiffen up and go to sleep. If Stephens does have problems on the feet, its generally against crisp, technical, diverse strikers like Cerrone and Swanson for example. He did very well against Swanson, and that was when Swanson was on a roll and should have probably been in a title fight. Stephens has so much power that he made Anthony Pettis want to wrestle him. You can count the guys on one hand that have stood and banged with Stephens. All of his strikes are home run, as evident in his brutal wins over Dos Anjos, Marcus Davis, and Rony Jason. Bermudez has straightforward striking with especially hard leg kicks when he throws them, but one thing I have noticed about Dennis is when he's striking from a distance, he is really slow with his head movement. He is super tough and wont shy away from a brawl, but that can't be the plan against Jeremy Stephens. If he can't get takedowns, Bermudez has the tendency to slug and not move his head which is never a smart idea when fighting Jeremy. There has been several times where he throws a punch and can't get his head out of the way in time for the counter. He has been dropped several times in the Octagon by Hayden, Holloway, Grice, Brandao, and Lamas, and those dudes can't compare to Jeremy in the power department. The thing with Dennis is that he's so tough and durable that he recovers very quickly and survives. What makes this fight so interesting is that when Stephens hurts someone, they go to sleep and there's no need for follow up punches. All in all, I don't see Bermudez posing any threat striking on the feet besides leg kicks. His head movement is slow and predictable. Jeremy is faster, more powerful, and more fluid. Bermudez gets dropped quite frequently and Stephens has a history of closing the show when he hurts guys. All of Bermudez's losses have come by submission but Stephens doesn't pose a threat in that area, and considering Stephens survived the Jiu-Jitsu onslaught of Charles Oliviera, I think he can defend subs just fine. Bermudez is a D1 wrestler and he has some really explosive takedowns. Stephens hasn't really ever been "humped" (technically speaking) in the Octagon in a very long time, especially since switching his camp to Alliance, but Dennis is the best wrestler he's faced along with Elkins. Bermudez also can be really sloppy with his shots and he can telegraph them but he pushes hard and wont stop. But lets take a look at the guys Dennis has taken down and beaten up on the mat: Hettes, Garza, Siler. All these guys are small physically compared to him, and their takedown defense is not good. Bermudez can just out-muscle those guys with ease. Stephens is just as strong as Bermudez, if not stronger. Bermudez, on credentials, is a better grappler than Stephens but I think Stephens can hold his own. All in all I don't see much of this fight taking place on the mat. Stephens has pretty good straight up takedown defense and a decent get up game. Bermudez's takedowns are explosive, but those were against smaller guys with bad takedown defense. I think Stephens stuffs some shots and forces Dennis to stand. As they stand, Bermudez will overextend and not move his head in time, Stephens will catch him and close the show with a KO. Jeremy Stephens defeats Denis Bermudez via KO (round one). Toasting the arrival of my Viking brother @GunniNelson to the Mac Mansion!! Thatch should have a decent advantage in the striking department. He throws very hard body kicks, punches, and is very good at winning exchanges in the pocket. Gunni isn't a bad striker by any means, he just has the tendency to be really inactive at times. His striking base is karate so he likes to feel things out before attacking. His hands are also held very low towards his waist which is not a good thing when facing a dynamic striker like Thatch. Gunni has a very quick straight right and a nicely timed high kick but that's about all we've seen in his arsenal of striking. He has a very good chin as he took the best shots from Story in his last fight. The Iceland native might have a bit of a slight speed advantage but not by much. I don't see him posing to much threats to hurt or finish Thatch based on his size as well, he's more of a natural 155er, and his style isn't really the type to put fear in Thatch just due mainly to his patient style. I don't see Thatch finishing Nelson with strikes, but his size, length, power, and fluidity give him the advantage on the feet. Gunni is going to have a massive advantage on the mat. He's one of the better Brazilian Jiu-Jitsu practitioners in the UFC. He has excellent trip takedowns, back control, and chokes. Even though he has the skill to dominate Thatch on the mat, his ability to hold down much bigger guys on the mat will digress as the fight goes on. For example, he briefly took story down in the 1st which took a lot of energy. After that round he flat out didn't have the strength or cardio to take him down. Thatch will probably have at least 20 lbs. on his counterpart come fight night. All in all, Gunni has a big advantage. but it its going to be very hard to take Thatch down and keep him there. Thatch should be prepared to defend considering this is probably the only way Nelson can win the fight. With all this being said, If Nelson can get Thatch down early in Round 1, and if Thatch makes one slight mistake, this fight could be over quickly. Thatch via unanimous decision. I don't see Nelson being able to take Thatch down consistently in this fight and I see thatch having his way on the feet. Gunni has a good chin so I don't think he'll be finished. Thatch stuffs the takedown attempts and picks him apart on his way to a decision victory. Brandon Thatch defeats Gunnar Nelson via unanimous decision. Almeida is a very crisp,sharp, and fairly powerful striker. He has 14 finishes by way of strikes and he trains at Chute Boxe. Almeida is better in every aspect in striking than Pickett. Hand speed, foot speed, power, and accuracy. Almeida is also very diverse in his combos, he mixes up body punches, jabs, leg kicks beautifully. Pickett does have decent power but he is lacking in the speed department. Pickett is very prone to counters especially when he's coming forward. Camus, Wineland, McCall, Barao have all had success using this strategy against him. Movement and punches with angles are the key. Almeida should be able to pick apart like alot of other fighters have but Pickett has a massive heart and won't stop coming forward. For a guy from the UK, Pickett actually has good takedowns. The only problem with that is he generally gets those against the fence and I expect Almeida to stand his ground and lead the pace of the fight. Almeida should be prepared for this as this is probably the only way Pickett can win the fight and those chances are slim. Almeida has a few submission wins but he definitely prefers to strike. I don't think hell attempt to take Pickett down straight up, but if he stuns him on the feet first. Almeida can finish him off with a choke with his brown belt in Brazilian Jiu-Jitsu. Pickett is super prone to counter punches, especially left hook counters. I think Almeida catches him on the feet in the 2nd round and finishes him off with a choke. I wouldn't be shocked if Pickett was able to survive the fight, he has a massive heart. 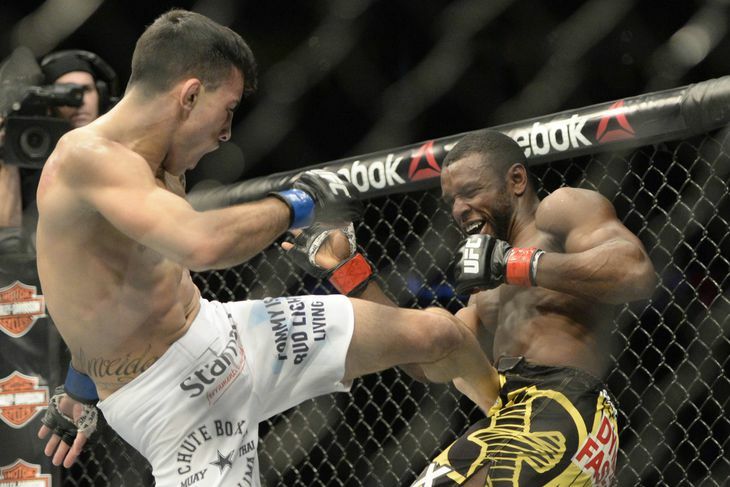 Thomas Almeida defeats Brad Pickett via Submission (Round 2, rear-naked choke). Both of these guys have similar weapons, but different approaches. When Brown is successful he is doing damage in wild exchanges at a frantic pace. When the fight is more technical and at a slower pace he is a completely different fighter. Means fights at a more calm pace, and he is super technical, especially in close range. The way he throws strikes is effortless, as Brown is more laboured and aggressive. Whoever implements their style of pace will most likely have the better success on the feet. Both of these guys have vicious elbows in close and will honestly probably nullify each other's clinch striking in my opinion. I have said for awhile, I love Brown's style as a fan, but I never thought he'd be a real contender in the division due to his recklessness. In his last 2 fights, he has kind of had to abandon his style due to the threats that Lawler and Hendricks bring to the table. In no way am I saying Means is on those guys level but once again Brown can't be reckless vs. a guy like Means who has very sharp counters. Most fans don't know Tim that well but he is super crisp and sharp with his striking technique, but it will be interesting to see how this will be if it turns into a brawl, because Brown has excellent success in brawls. In the Lawler fight, Brown ducked his head down a lot after throwing strikes which is never a good idea with a guy that has sharp counters like Means. We all know Brown is susceptible to a body shot and has been hurt several times in the cage, but his warrior spirit and heart allows him to come back and win most of the time. Means has only been dropped twice in his UFC career but he recovered both times extremely quickly. All in all, I think Means is more of a smart fighter than Brown, and I don't think he will engage Brown in a brawl. I think he is overall a better striker, with better technique, movement, head movement. I don't see too much of this fight taking place on the mat if any. Brown has a very good trip takedown from the clinch but the close range and clinch game is Mean's specialty so I doubt Means falls for that. Means has underrated wrestling, but not the type to hold Brown down consistently. Both guys have been controlled on the mat before. Brown is very underrated off his back but he only has 1 win by sub in the UFC and that was years ago. Means did submit his last opponent George Sullivan, but I don't look too much into it because George Sullivan is no Matt Brown. Brown has been submitted several times in the UFC, but that was a completely different guy compared to now. Means has never been in danger of being subbed in the UFC, and I don't see either guy being able to submit the other. I think Means is a very smart fighter and will not engage Brown in a brawl. When Brown wins, it is in wild brawls and in wild exchanges, and I don't think Means will give him that chance. That is the most likely and only way Brown can win the fight. I think Tim plays it safe, stays at a distance and out-strikes his way to a decision win. I think Brown will have his moments but I think Means' striking will be too sharp and crisp for him. Brown leaves a lot of openings, and I think he'll overextend and get countered at will by Tim. Tim Means defeats Matt Brown via unanimous decision. We're all set for a historic night at the MGM Grand Garden Arena in Las Vegas—will the McGregor era reign supreme? Who will take the Welterweight throne? The countdown is on. Complete breakdown, predictions, preview and more for UFC 189: Mendes vs. McGregor.